– My friends, family and everyone I love – blah, blah, blah. Perhaps writing here was a bad idea- there’s already a chocolate smudge on my page before any ink or words of wisdom land on the page. 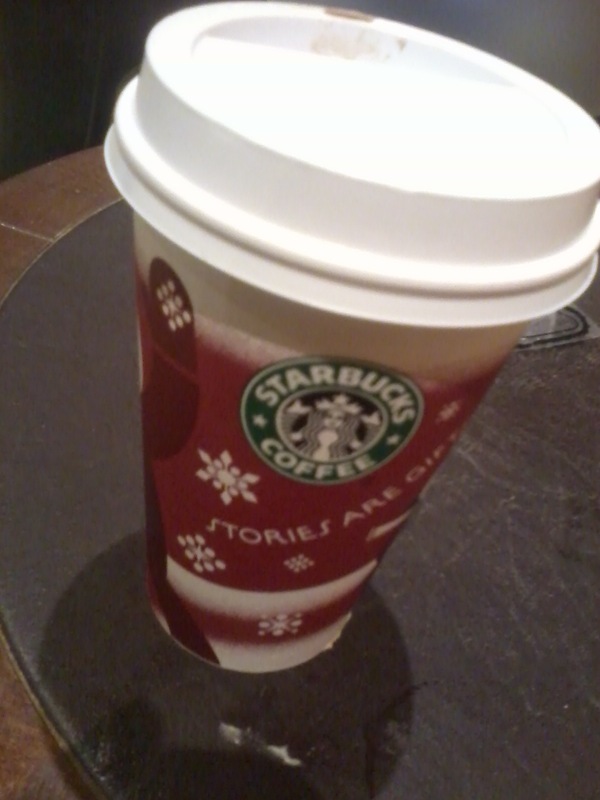 I’m sat in Starbucks, sipping down my hot chocolate, while trying to think straight with all this chit chat going on around me. I thought that this would be the kind of place to get some peace and quiet. Oh, how I was wrong. With the gift of hindsight that thought makes me chuckle a little bit (with sadness). This wasn’t the first ‘Bucks’ I’ve been in today. I’d say it’s about the eighth. The first one I went in was busy, so I thought ‘it’s about lunchtime’ so I wandered around Monday-afternoon London until I found the next one. Apparently they are all busy. I don’t know where I got the idea that I could find peace in this place but I doubt it was based on anything I found in reality. Perhaps a dream? Probably some opportunistic residual ‘Friends’ memory I thought I had forgotten. Anyways, I realized (disappointingly slowly) that it wasn’t going to happen and I gave up peace in exchange for the caramel-hot chocolate I’d been craving since Starbucks number 1. It was alright. Just alright. It’s the classic ‘want-something-so-long-and-when-you-get-it-you’re-disappointed’ scenario. I am however enjoying creating brand new adjectives to describe just how chocolaty my hot chocolate is- chocolicious? choctacular? My personal favourite is supermegachocochoctastic- get that in scrabble and you have won, my friend. I’m sharing my table with a blonde-haired chap with skinny jeans and the world’s most colourful shirt. It’s like he just returned from the world’s most unsuccessful bout of paintball, ever. But it’s actually quite jazzy and trendy and yes, I do want one. He’s alternating between poking his nose into a tatty, dog-eared book and checking facebook for updates. I detect a hint of providence that we are sat at the same table. We seem to be the only people in this place who are being quiet. There’s not much else here worth mentioning. It’s the quintessential cosmopolitan coffee house. The wall are all warm oranges accentuated with rich brown elements and mint green armchairs. There are photoboards of artists hanging everywhere, although I think I’m using the word ‘artist’, well, incorrectly because one board is Sharon Osbourne. Everything in here looks ‘natural’ which is ironic considering it’s a replication used for a multinational corporation. This afternoon I have noticed something about my writing- it has the tendancy to go off on tangents. It never goes A to B. It’s always A to G, back to E, circle around that hippo thing there and then canoe the rest of the way to B. I’ve heard that the way you write is a reflection of the way I think, but it never really dawned on me until now. My writing, like me, somehow has a short attention span. I can’t tell if that’s my weakness or what makes me special. Either way, that’s the closest thing to a lesson or a point this session will come. Aside from that consider it point-less, like hot chocolate, or Sharon Osbourne. 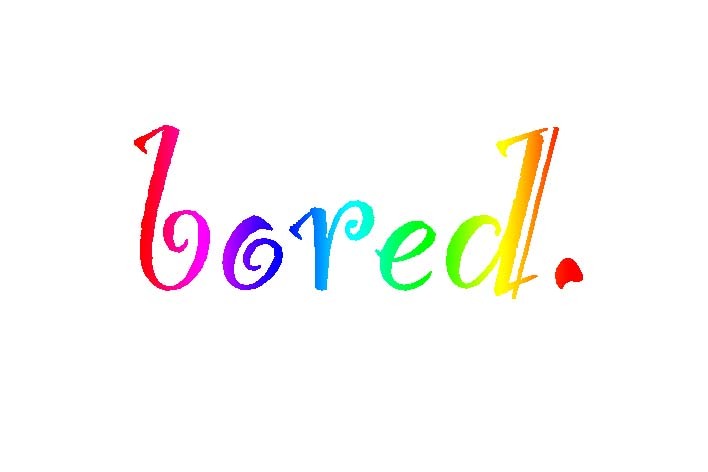 There’s a word that’s been on my mind a lot today – bored. It tends to be seen as a negative feeling but is it? Does it have to be seen like this? Why can’t it be seen like this? 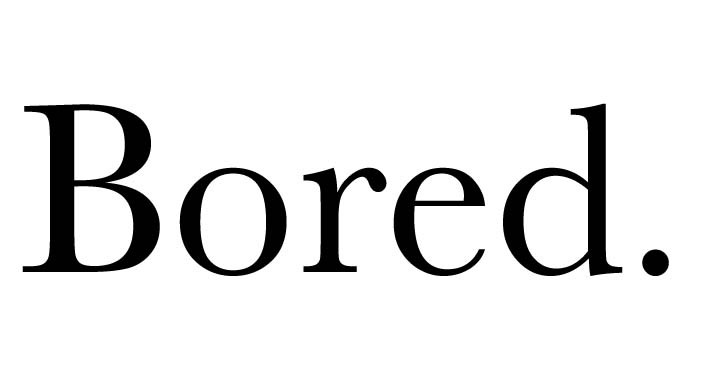 My opinion is that bored should be redefined. It can be positive, perhaps even exciting, as contradictory as that sounds. Bored is an opportunity, it’s a challenge. It’s the interval between one memorable moment in life and the start of the next. It’s a hunt for something interesting. The recognition that your current activities or lifestyle are not stimulating enough to warrant your full attention and effort. It is the availability of time, coupled with the desire to use it more productively. The motivation to change our lives for the better. When you think about it, wouldn’t the world be a better place if more people were bored? I talk too much about advertising. I don’t like people in advertising who only talk about advertising but my posts have all been advertising, advertising, advertising. I can’t even open a post without talking about it. It’s what’s on my mind but it isn’t what this blog was for. It was for all the things I find creative, inspirational and wonderful on this ride through life. It was to motivate me to go explore and wander until I found things that make my heart excited. It didn’t have boundaries. It wasn’t for anything. It was just a document of my hunt for beauty and eccentricity. I got off course and wandered off, much like I do in real life so I’m going to try to somehow find my way back. Write about things that interest me. Advertising interests me but so does design, music, photography, technology, philosophy… pretty much everything. This is a declaration of intent. To expand my horizons a bit. I am somewhat trapped in London, one of the richest cultural places to be so I am going to try to soak up a bit more and find some inspiration. Not many people know this but I studied ‘Music Placements’ on television for my dissertation. The point was to determine if it was an appropriate method of promotion for music artists. However my study only looked at tv shows. It didn’t look at adverts. I can’t help but notice, a lot of the adverts today (literally- today) have popular music in them so, I thought it might be worth some pondering. I guess that happens when you watch as much tv as me. Personally I think it works best when an independent, upcoming artist is used because their songs have a degree of flexibility with regard to their perception and understanding. They can be easily manipulated by the cinematography and imagery to depict a particular feeling or story. This is my favourite at the moment. It’s the new (and very early, in my opinion) christmas advert for Matalan. The spot features ‘What I Wouldn’t Do’ by A Fine Frenzy in the background and it works so well. Its warm, it’s natural and it’s baked full of christmassy goodness. Alison Sudol’s voice can only be described as beautiful, which only enhances the feel. The same goes the BT ‘Infinity’ advert. The song in this is ‘Corner’ by Allie Moss. Similar music and feel. In contrast, the ad for Assassin’s Creed: Brotherhood is awful. Not just the music but the whole presentation just lacked that element of finesse that makes an advert shine. Tinie Tempah was a poor choice for it. It’s a great game and good song but it doesn’t fit and I think part of that is due to having a song that listeners have already heard an interpreted with their own meaning. I personally would have used something like ‘Koyaanisqatsi’ by Philip Glass as it creates more of an epic atmosphere that Assassin’s Creed deserves.